This is my very first blog entry, and I thought this would be a great place to share with you my next taiko journey. I am working on opening a taiko studio some where in West LA. I'm in the midst of taking business classes to see what exactly I am getting myself into. I have been teaching for a long time now and all of this business "lingo" is all very new to me. I have so many questions...how do I start a business? Will I have enough members to sustain the business? Luckily, I have been in contact with Diana Wu, the leader of Naruwan Taiko in San Diego, and she gave me some awesome tips and advice which has helped me tremendously. This past weekend, I had dinner with Victor Acosta, a Muay Thai instructor at the Thai Boxing Institute in the Venice area who started his business from scratch. He truly worked his way up the ladder and opened TBI while learning how to run a business at the same time. He also gave me some helpful advice and I am grateful for both Diana and Coach Vik. I feel like I'm taking a huge jump...a jump that is basically pushing me out of my comfort zone which feels very...terrifying to say the least. I'm sharing my journey with you for accountability on my end. My heart and gut is ready to take the ext step in my taiko career but getting through the very beginning stages is the hardest part. My family and loved ones have been so supportive, and I know their strength and encouragement will help me get through this new journey I'm partaking. Thank you everyone for all of the support and wonderful feedback! Again, this is my very first website and I am learning as I go during this new journey. Videos and pictures of our recent performance will be posted soon. Please stay tuned! Hi everyone! Here is a short clip of our performance from a few weeks back at Culver City High School. We had the privilege of performing for an event, Culver For A Cause where students from CCHS organized a 5K to support education. The runners and volunteers did an amazing job and we hope to be back next year! The video features our group performing for the runners as well as an impromptu performance from former El Marino Rainbow Taiko students. Enjoy! Pictures and videos by Jolene Niwa. Hi everyone! A quick update as to what we have been up to the last 11 weeks or so. Seiji and I (Tomomi) signed up to take a class at Asano Taiko U.S. in Torrance under the instruction of Kris Bergstrom and David Wells. For 11 weeks, Seiji and I learned a choreographically challenging piece called "Karc Joan of Arc." We finally reached the end of our journey by performing in front of our loved ones. Here are a few snaps from our mini recital. Otuskaresama to all the members in the class, teachers, and Seiji! The rest of the members of Nakama Daiko are currently learning this piece and we cannot wait to perform it as an ensemble! We have a performance coming up next Saturday at El Marino Language School in Culver City. We will be performing with El Marino Rainbow Taiko, and it will be our first ever collaboration. I am very excited to see these two groups sharing the stage. We will also be performing "Karc Joan of Arc" and "Jack Bazaar" by Kris Bergstrom. Hope to see you there! Check out our lastest Vlog from our recent performance with El Marino Rainbow Taiko! May was a busy month prepping and performing with El Marino Rainbow Taiko. This month, we had a few weeks to "chill" as to say so we went ahead and got one of our drums re-skinned from Kato Taiko at Asano Taiko. Sad to say, each of our four drums has a hole on one side of the drum. Even worse, we had one chu daiko that had a hole on both sides so it was in need of re-skinning. It is crazy to have all of these taiko resources so close to home. "Back in the day"a.k.a five years ago, we had to ask friends who were visiting Japan to buy a whole bunch of bachi for us, even tabi! We are very lucky to have Asano Taiko here in the U.S. where we have easy access to bachi, costumes, instruments, and taiko making! Next month, we will be performing at our very first obon event. 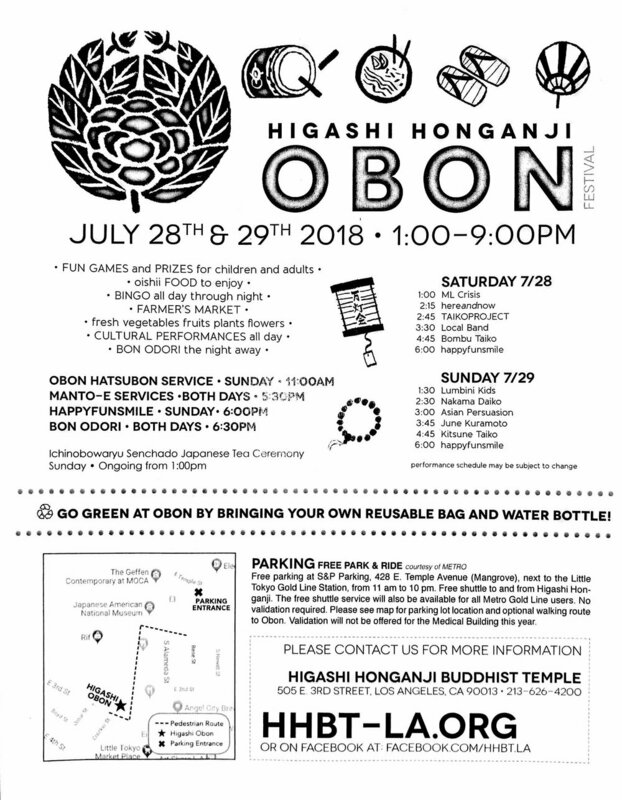 Come check us out at Higashi Obon on Sunday, July 29! Time is TBD, but I am so excited to share this experience with Nakama Daiko. Nothing like performing at an Obon in front of friends, family, and the smell of chicken teriyaki. :) Hope to see you there! Here it is, ya'll! Come check us out on Sunday, 7/29! It has been awhile since our last blog update but we are back! We had so many exciting events this weekend and we can't wait to share it with all of you. First off, Asano Taiko U.S. celebrated their 5th Anniversary since their opening back in 2013. Thanks to my friend, Derek Oye, I was very lucky to be part of a discussion panel with some of the O.G. taiko players in America as well as those who began their taiko career in collegiate taiko. In the discussion panel were: Johnny Mori, Tiffany Tamaribuchi, Donna Ebata, Darren Endo, Blaine O'Brien and myself. Together, we discussed how we were first exposed to taiko and what made all of us decide to play. It was pretty cool seeing my dad (Etsuo Hongo) being represented in the presentation. After his big move to South America, I feel as if his presence slowly disappeared from the taiko community. I guess one of my goals is to continue to tell not only his story, but of my entire family. In a nutshell, it was pretty amazing to hear how Johnny and Tiffany began their taiko careers because it isn't something you hear about everyday. The perspectives, experiences, successes, and challenges we have all faced or continue to face is what makes the taiko community special. It is crazy to see how much the community has grown in the last decade. I hope it continues to grow because like Johnny said, "We are lucky that we have nice people in the taiko community." We are taking a mini break during the month of August to recuperate from recent performances and taiko festivities. We had a blast performing at Higashi Obon and creating music with the audience members. Special thank you to Byron Yamada for connecting us to Higashi and David Ikeda for coordinating the logistics of the show. 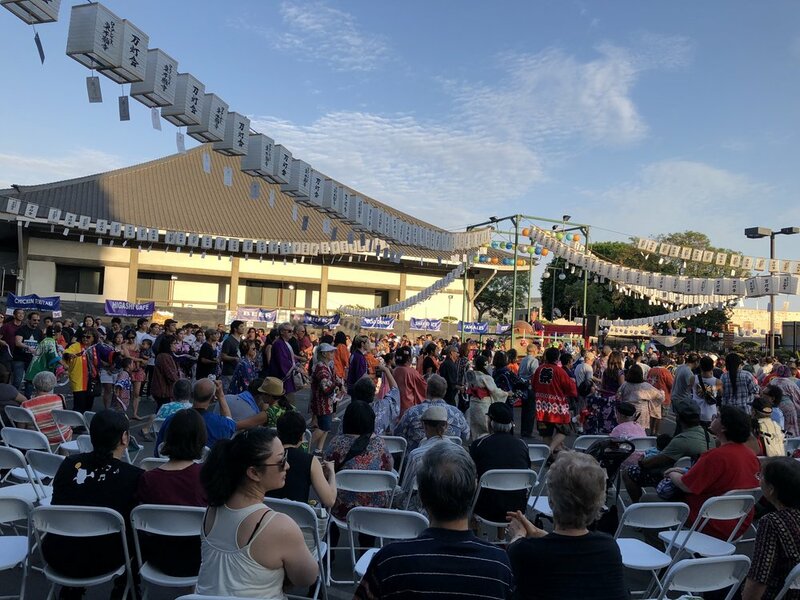 For this entry, one of our members, Nixa Starr wrote a special blurb on her experience from our performance at Higashi Obon. Check it out below! Hello! I’m Nixa Starr and I’ve been with Nakama daiko for around 3 years. I had the wonderful pleasure of performing at Higashi with our group. The audience was playful and cheery so it was a fun and enjoyable experience to perform for them. This is the first time we’ve performed for so long and interacted with the audience. Having audience members come up and hit the drums gave them a little bit of perspective on what we do. Every performance is unique and different and a whole new experience. I think that is what makes performing so fun and so exhilarating. Since I knew that there would be a good sized crowd, the nervousness hit me hard. This performance really motivated me to practice! I’m excited to practice more and more, polish and perfect my skills so I can become better. Thank you so much for your support! We would love for you to join our taiko team! My goal as a taiko teacher is to spread the art of taiko to the next generation of taiko players. Being part of the taiko community, I have noticed that the youth ensemble has very little to no recognition. 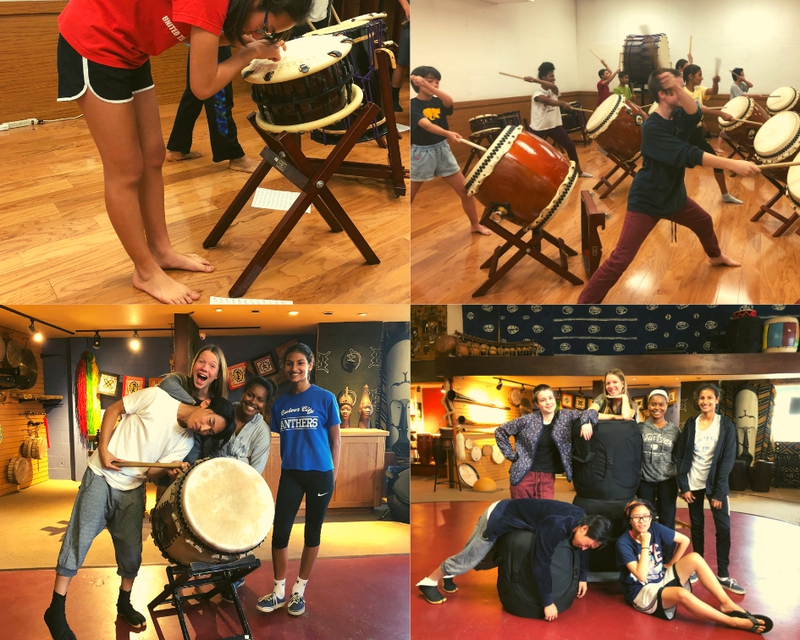 There are so many talented youth groups out there such as Zenshin Daiko in Maui and San Jose Junior Taiko just to name a few. We should recognize all of these talented groups out there, especially to our young ones. Come be part of this great taiko community. You won't regret it, I promise! Thank you to Motherland for letting us practice at your beautiful facility alongside the handmade instruments in your space. Shoutout to Dan and his son, London for taking great care of us! Check out their website here to see all of their instruments and classes that they offer. They also handmade our bachi bags which have been AWESOME! Definitely a good place to check out! With that being said, we are returning to Asano Taiko this weekend with five new members! Stay tuned to see what we have up our sleeves during the next few months. We will exploring body movement and creative expression to fine tune our own style of taiko. Also…some big news coming up from Tomomi very soon! Stay tuned! Here it is folks! Tomomi will be leading two workshops at the next North American Taiko Conference in Portland! Be sure to check out https://natc.taikocommunityalliance.org/ to get up to date information. Thank you for joining us at CicLAvia! Thank you to Keiko-san at Sunny Blue for giving us the opportunity to perform! Everyone should check out Sunny Blue and all of their various delicious musubi options.